I've heard there are ways to get a free copy of Windows 7, but I don't want to break any laws, or get a hacked version from some file sharing site. Can I really get a free, legal copy of Windows 7? Windows XP is no longer supported by Microsoft, and it is becoming increasingly obsolete. More and more new applications for Windows 7 are being released, and many have compatibility issues with Windows XP. Sure, you can tweak Windows XP settings to make incompatible Windows 7 apps run under it, but that's time-consuming and performance may be compromised. It's better to bite the bullet and move up to Windows 7. But that doesn't necessarily mean you have to buy a copy of Windows 7. If you are a student, there are a few ways to get Windows 7 for free, legally. If you're not a student, you can still get a legal, licensed copy of Windows 7 for free, at least temporarily. Sooner or later you have to pay Microsoft to keep using Windows 7, if you want to stay on the right side of the law. Here are your options for getting Windows 7 for free. Until April 29, 2011, anyone can download Windows 7 for free from Microsoft's official site and use it for up to 90 days free of charge. The trial period of Win7 Enterprise (the top of the line version) gives you a chance to learn Windows 7 and see how your existing apps perform under it. But at the end of 90 days, the trial version will shut down once every hour. Obviously, this is not a great solution for the long haul. Go to the MSDNAA School Member Search page. Select your school using the pulldown menu options. You will be shown the department and software center from which you can download Windows 7 and other Microsoft products. You will need login credentials supplied by your school's IT department. Use them to log in and download what you want. If your school is not yet a member of MSDNAA, ask your administrators to apply for membership. Here's one more roundabout way to get a free copy of Windows 7 64-bit. Note that you must be a student at an accredited school, and your computer must support 64-bit computing to make this trick work. Download Windows Server 2008 R2 (Release Candidate 2) from the Dreamspark website. It's basically a Windows 7 workstation (desktop) edition optimized for running a server. It comes in an ISO image file of 2.8 GB, so have a blank DVD, DVD burning drive, and ISO image burning software such as MagicISO at hand. Burn the ISO image to a bootable DVD and you have a Windows Server 2008 installation disc. Install Windows Server 2008 using the link in the previous paragraph, then read this ZDNet tutorial for instructions on tweaking it to run as a Windows 7 workstation. I strongly urge you to resist the temptation to download a cracked (illegally activated) copy of Windows 7 from a peer-to-peer network or "warez" site. It's illegal, for one thing. But there are other pitfalls to downloading a bootleg copy of Windows 7. Such copies are often deliberatly corrupted and can leave your computer open to hackers or infection with malware. 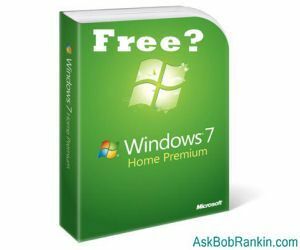 Most recent comments on "Free Windows 7"
What about those of us who purchased Windows Vista and were completely dissatisfied with the product and went back to XP. Will Microsoft offer any kind of compensation? Just to clarify: Free student = free + shipping. My price was $23.00. Still a heck of a price for Win 7. Windows 7 Enterprise can only be activated with a Volume License MAK or KMS key if it is not activated against a local KMS server. Enterprise requires a VL KMS/MAK out of the box or activation against a local KMS server. It can be rearmed up to 3 times. Windows 7 Ultimate edition activates conventionally via the internet to Microsoft activation servers. Unless you are in a business enterprise environment, then Windows 7 Ultimate should be your choice. ----for the price of the Enterprise Ed. you can buy a new cheap computer with Win 7 pre-installed. I have generally been happy with XP. In fact when I finally moved to SP3 a year or so back it caused such conflicts that I had to replace much of my computer in order to revert to SP2 and IE7. The application which made the trouble (a Government site I work with daily, dah) has finally upgraded enabling me to return to SP3 and IE8 and I think it will also accept 7. What I need to know is, will 7 enable me to continue accessing old DOS applications (including in right-to-left alphabets) which cannot be upgraded? I am concerned about your statement that Windows XP will no longer be supported. In the long run, does this mean I will have to buy a new computer? EDITOR'S NOTE: That depends how long your run is. On a practical level, a computer becomes functionally obsolete after 3-5 years. But you won't need a new computer just to run Windows 7. It should run as well or better than XP on the hardware you have now. When you say "Free to students" is there also a place to send off for a copy of Windows 7? I've enjoyed receiving your emails over the years. They are a source of contant enlightenment and enjoyment. Query: If MS WinXP is no longer supported, why is it my two 2002 vintage towers running XP-3 are still receiving critical updates from MS on MS's "fix-it" Tuesdays? What am I misunderstanding? I am wondering about all my apps if I move to windows 7? Such as an older version of Photoshop with no new key? My older version of Photoshop does not run with Windows 7. I have to toggle my monitor between an XP computer and a Windows 7 computer and transfer files between the two. Irritating, especially since I really don't care for the setup or bells and whistles on Windows 7. Overkill! Change for the sake of change! Many of the questions about WinXP intrest me. Is there somewhere I can go to read your responces? Or, do I have to ask the same questions again and hope for a personal answer? I'm in the market for a Portable GPS for my car. There are so many brands with so many features. I just want to go from point A to point B and from anywhere to point B while I'm in the vicinity of point B. Is there any one brand that you recommend that also has memory?